Hi ! Remember the song : There's nothing like the real thing ,ba..by. There's nothing like the real thing..
With these classics of classucs- h\just go for the real thing.. I have in extrai, Joy, and 1000 -Patou. M- are they available inany stores ( I;m not comfortable on ebay)? Are these available in te Paris boutique ? You are so right, Colombina. Some fragrances say WOMAN, and we should consider very strongly wearing them often--nice as the unisex fragrances are. Nothing says WOMAN like a fine chypre. To wear it you have to be grown up and *know* you are grown up. It's a shame I've never tried Cocktail--or met Nick and Nora Charles. What fun they'd be. I can only hope that these are in tha Paris boutique. If they are not, they should be: Patou deserves (as so many other houses do) their own museum. General Motors apparently has a wonderful museum with loads of cars from over the years as well as their concept cars. I think perfume houses should do the same. Personally, I'd pay to have the Patou "E" ticket tour! Even as a (some would say resolutely) gay man, there is nothing more exciting than a woman in touch with her WOMAN. Mostly it has to do with her carriage, the way she goes through life, the way that time and experience and intelligence and spark have burned off a bit of the puppy-fat and left creatures of wit and smarts and cheekbones and challenge. I am proud and happy to be included in the lives of several women in this group from 37 to 92 and I bask in their reflected glamour, and strive to keep up. You could not pay me more of a compliment than mistake me for our dear Columbina, and for that I sincerely thank you! Another woman (although really a child, compared to me!) who is a constant source of surprise and not a little bit of envy. Tom, I do read the bylines so I knew it was you, and couldn't agree more on Joy and Cocktail -- haven't sniffed Paname, which is, by the way, the argot name of Paris. Patou, the fashion house, has an interesting history as initially, in the 20s, it produced not only gorgeous and simple sheaths for eveningwear, but rather sporty and dégagé daywear. In its last incarnation before shutting down its fashion production, it was headed by Christian Lacroix and featured his first uber-eighties pouf dresses. Now the scents... I own two Ma Collection in their 80s re-editions, Cocktail and Colony, and what I feel about them is their essential *wit*. Unlike their current classics 1000 and Sublime, which have more gravitas. I believe the discontinued scents can be sniffed on the first floor of the Parisian flagship store, by appointment only. I've yet to make it there, but I will. heh heh. Just teasing you, T.
Well, why wouldn't you like all of these, including Pan Ame? 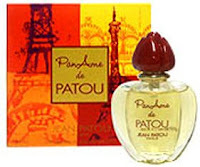 Even if it was called "Le Fruit d'Floral" it's a vintage Patou, and that stuff *rocks. * BTW I think at some point dragonfly00 on eBay was selling sets of the Patou Ma Collection samps. So glad you've reviewed some of the Ma Collection scents. Love them! And they're amoung the very few scents where I think the boxes are almost more amazing than the bottles. *Fab* patterns. I need to retry Pan Ame, but Cocktail is pure elegant perfection. Of *course* you could wear it! I am so glad you reviewed the Patous. It is such, such a shame many of their wonderful scents are gone. If you look at their website, all they show is Joy, 1000, ENjoy and Sublime...I mean, these are great scents, and I adore 1000, but....they could have had so much more! I love Joy! It is a beautiful, beautiful perfume. It's the ultimate floral fragrance, what a perfect blend! To me all the concentrations are wonderful, the pure perfume of course being the best. I am never without a bottle. I feel the Patous don't really get the attention they deserve in the perfume market, often overlooked, difficult to find and in general kind of forgotten. I'm glad to see them reviewed here. I have never tried Cocktail but now I am very interested in it - and yes, I too think that nothing says "woman" better than a very elegant chypre. Thanks for refreshing my memory- I'd forgotten that Lacroix worked for Patou. I may get to Paris this summer myself, so I might be sniffing as well! I have to confess that I have never smelled enJoy. I figure, why? I like the original. The lite version can't help but disappoint. Since you say so I will! When I think of all those wonderful bottles that were lined up on those shelves at Bullocks Wilshire I could sob. They had Normandie in the boat-shaped bottle (which I am sure was a factice, but might have been there since the depression. Were that I was there the night of the riots. I would, with a sense of duty accomplished have lifted a bunch of them. Aren't I terrible? They don't and I wonder why. Perhaps they don't advertise enough? I hope they don't get swallowed up by LVMH or Dow or someone and start having the problem of having the capital to advertise but having products that make me retch.. So, you loves you some WO-man scents, yes ? So, you're channeling Marinushka today ? How does it feel to be a petite Baltic blonde ? Joy was my first grown-up girl fragrance, but I need to go and resniff it because I ordered it from the back of the Sunday Supplement in the 1970s, so I'm thinking.... not really Joy? All the Ma's I have smelled have been a wonder, and I wish they would bring them back. Tom, please don't be a stranger when you come to Paris (that goes for all you people, of course). We'll do us some serious sniffing! I think you should go sniff again. It's wonderful. The MA's have to come back. I am keeping my fingers crossed that the project I would be working on works out and that I will be able to take that trip. Of course I'd want to meet and do some serious sniffing- even unto the Marais! Jeesh, I need to remember to load some French discs on my iPod- I haven't spoken it since high school! A thousand apologies, Tom! And for me to do that after you had paid my group of humanity such a compliment! I guess the cowardly way out would be for me to blame my confusion on my maturity? Alas, I wish cheekbones came with the package. Beautifully written, Tom. There is a collection of 12 original Patou scents from 1925 to 1964 available now (October 2007) in minis from, at least in Washington State, Perfume Hut and such outlets. Worth it to get to smell them--it includes Cocktail, by the way. I've used Joy for more than twenty years, and kept wondering if I was beginning to smell like an old decaying woman and ought to try something more current. Thank you for your lovely review; I'm inspired to maintain my relationship with this lovely scent.